We realize just how much the job scenario has changed over the course of the last year as we welcome the New Year. Career ideas in Bangladesh will surely reflect how much we continue to rely on technology across all industries and sectors according to the job market of 2018, both globally and consequently. As we adapt to technological innovations and people associate themselves with various new roles in the workplace, the definition of career and success is shifting. Not all jobs are techs while streams of new jobs are created by the rising adoption of technology. It’s considered as the best career in first-class jobs like BCS (Bangladesh Civil Service) in Bangladesh. As there is the respect and security of the first class officers in Bangladesh is given the best of any other profession, most of the university student dreams will be a first-class officer after completing their study. Also, BCS cadres get the highest advantages in the government jobs in Bangladesh. That’s why most of the student takes preparation for BCS examination at the end of their students’ life. Moreover, another reason for choosing the BCS job due to the clear career ideas in Bangladesh. But, the concept is not totally correct because there are some jobs in private sectors that can pay them some multiplying higher salary than the government jobs. For example, an expert mobile app developer earns about 1 lakh to 2 lakh Bangladeshi Taka, which is more than any kind of government job. What are the Top 10 Career Ideas in Bangladesh? You’ll be pleased to hear there are a number of high-paying jobs you can be qualified for with just a bachelor’s degree if a graduate degree isn’t an option, and high earning potential is what you’re looking for. 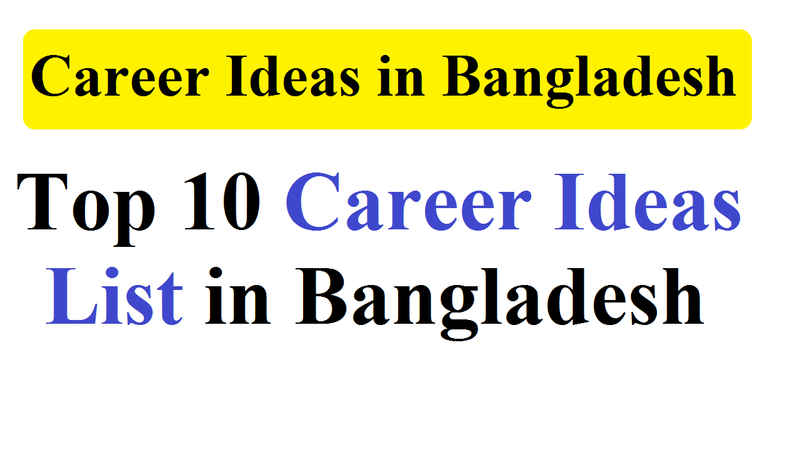 Well, let’s know about top 10 career ideas in Bangladesh. Based on promising careers, job openings and in-demand skills which are best suited for jobs in Bangladesh, the following top 10 lists are compiled. Although it’s quite unlikely for medical jobs in Bangladesh to ever be out of demand, it’s even experiencing a slight dip. The demand for newer medical professionals who can adapt to innovations in the medical industry is only increasing with every passing day with growing numbers of medical institutions and technologically superior diagnostics. Career Outlook: High For engineering jobs in the world, there is incredibly huge progress in technology, science, and computing creates an even more stable career outlook. Also, it’s in high demand at least for the next decade in Bangladesh. Moreover, the lowest unemployment rates are in this industry as well. But, for a deserving candidate, most engineering jobs in Bangladesh fail to offer the expected salary. Although technology has arrived, it’s not getting down soon. And, it’s likely to be a trend throughout the future with the rapid innovations due to advanced technology year-over-year. As it has opened an incredible amount of opportunities for IT and telecom jobs in Bangladesh, the dominance of IT is undeniable across every sector. Basically, every job is in some way or fashion can use IT support staff in the current situation for jobs in Bangladesh. Although they differ quite a lot, freelance jobs may seem similar to part-time jobs. They are most often project-based work of freelancing jobs in Bangladesh. The key factors for freelancing jobs and workers must rely on securing some regular clients are the performances and deadlines. It’s not only most suitable when considering establishing a career but available for every industry and every sector as well. It’s surely going to be one of the most sought-after careers when talking about online marketing jobs in Bangladesh for 2018. Also, it’s rising globally of the demand for skilled online marketers. And it has created greater scope in the digital scope due to the rapid advancements of Bangladesh through internet and mobile. Online marketing expertise is in demand and the supply is simply not available in the level of expertise that recruiters expect whether its consumer products or services, retail or wholesale. As they are the least likely to be affected regardless of the economic conditions, sales and marketing jobs in Bangladesh are always in demand. Also, sales and marketing jobs are always available whether the economy is going through a recession or a boom. As volume almost always guarantees turnover in sales and marketing, the demand is high and companies always require more sales and marketing staff compared to other departments. The job market and even more now in Bangladesh has a constant demand for the data entry jobs. Adapting to technology and digitalization the need for data entry specialists are growing constantly, with more and more companies, both private and government. But, data entry jobs in Bangladesh have little or no potential, which is a common misconception about it. For a long time has been dominated by the Indian subcontinent in the call center industry. It’s 100% reliant on fluent communication skills in English while outsourcing of this crucial customer service method. as many companies look to outsource but are keen on avoiding India, recently call center jobs in Bangladesh. It’s growing rapidly when we talk to part-time jobs Bangladesh such as receptionist, waiter, cashier, transportation, delivery, and others. The biggest advantages of part-time jobs in Bangladesh are on-demand availability and flexibility. Almost anyone and everyone is able to grab every available opportunity for a dependable source of extra income form students to regular job holders. You’re working in or which part of the world you are in, the customer is the king regardless of the industry. Every industry, every field, and every sector is experiencing rapid growth due to the boom in technology. As customer success is more important, sales are increasing across all platforms. Although it’s become very easy to reach new customers globally, ensuring customer satisfaction is still a challenge.